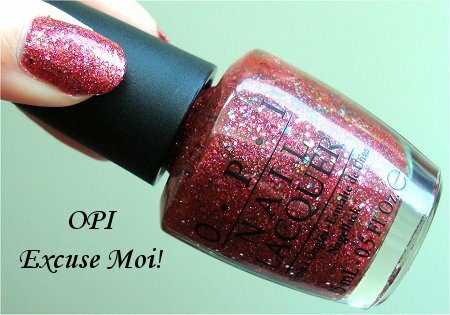 OPI Excuse Moi! is the pink glitter polish from the OPI The Muppets Collection. 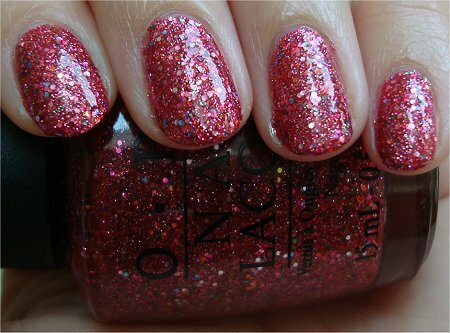 At first I overlooked it because I had my eyes on the chunky glitter polishes, which I previously swatched and reviewed. But I had to try this one out because I thought that perhaps this would be the pink that I would fall in love with. It’s different than what I expected. 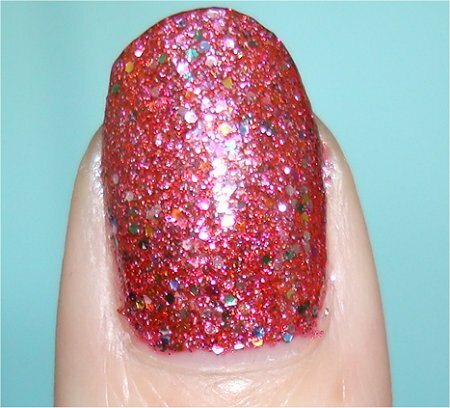 The other glitter polishes take 3 or more coats to cover the nail, and they’re really meant for layering. On the other hand, OPI Excuse Moi! is waaaay more pigmented and isn’t really meant for layering over other polishes. While this colour isn’t my favourite pink polish, it definitely gets points for being unlike any other pink I have in my collection. See all the multicoloured glitter? Your bottle will look different than mine. That’s because PR sent me this. I’m showing it just in case the serial number is helpful to someone. 2 coats of Excuse Moi! 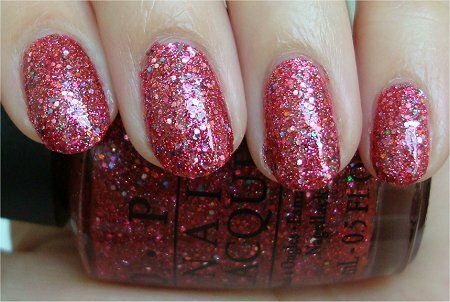 Press Release: You can view my blog post on the OPI The Muppets Collection press release here. Where to Buy: It was supposed to be officially released on November 1st, but I’ve already seen it at Trade Secrets, so you’ll probably be able to find it easily at beauty-supply stores now. Excuse Moi! 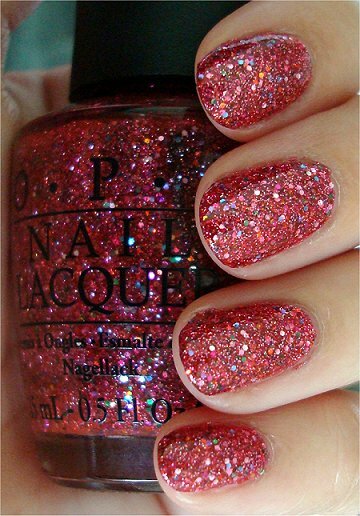 by OPI is a medium, saturated pink base with multicoloured glitter. The fine glitter is pink and silver. The large hexagonal glitter pieces are yellow, orange, green, blue, pink, and silver. The overall effect is very much candy-like and blingtastic. I imagine a greedy little monster (who ate too much candy in a short period of time) puking all of this out. The pink and silver are the main colours that stand out – they’re like the gym rats who hit the weights on a daily basis. I was hoping that the other colours wouldn’t be bullied into the background, but, unfortunately they were. Oh, those lightweights! Also, please note that to the naked eye, in most lighting, the polish tends to look more like what it looks like in my flash and sunlight photos. I included the natural-light photos so you could see all of the colours better. 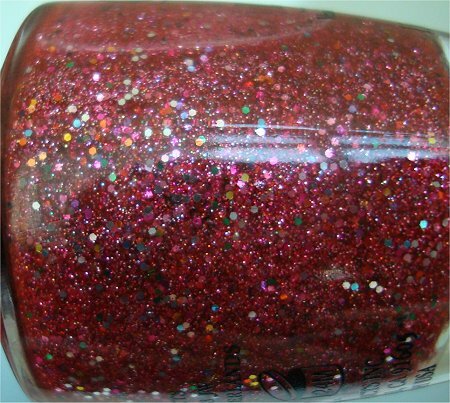 This is a polish that’s chock full of glitter, so you can’t expect it to be as smooth as a creme lacquer. Yes, it has noticeable texture, but it’s definitely not sharp or rough. It’s smoother than most glitter polishes. And a top coat will definitely help. 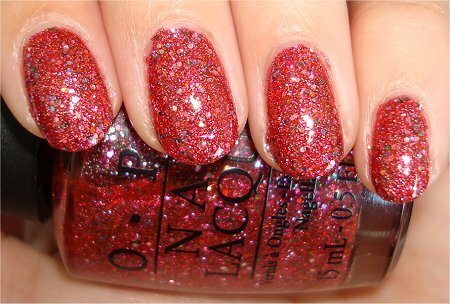 Unlike the other glitter polishes in this collection like OPI Rainbow Connection and OPI Gone Gonzo! that have clear bases, OPI Excuse Moi! has a pink base. This helps greatly with building up opacity. I needed just 2 coats to fully cover the nail. 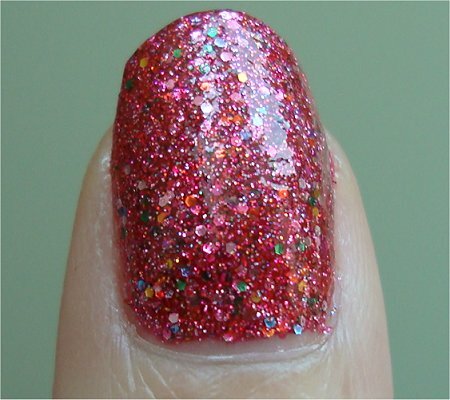 Because of this, I don’t consider this a polish suitable for layering on top of another base colour. It stands up well alone. 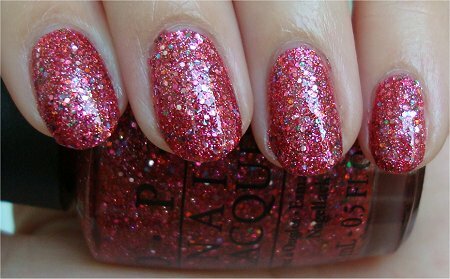 I liked this formula better than the other glitters in the OPI Muppets Collection because it seemed like it was easier to control the glitter when it was suspended in this pink base as opposed to the clear base. Those who like this shade of pink will be thrilled because the application was great and required just 2 coats. But, I had to give this a low score just because the polish didn’t move me. I was much more excited about the other colours in the collection. 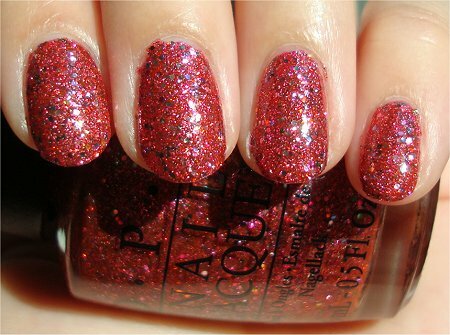 Which colours in the OPI The Muppets Collection did you pick up? Did you buy the full-sized bottle or a set? 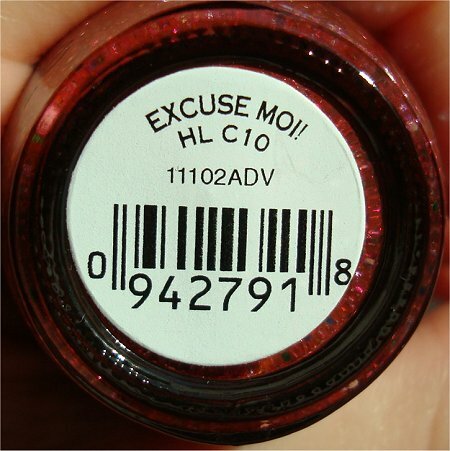 Were you excited about the opacity of Excuse Moi!, or were you also hoping for more rainbow-glitter goodness? 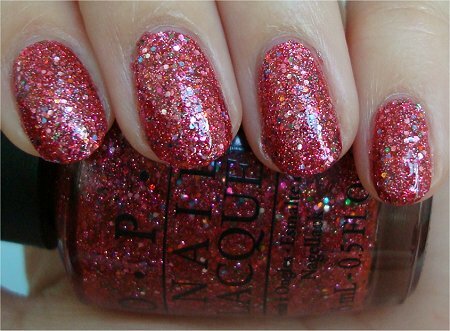 This entry was posted in Nail Polish Swatches & Reviews, Product Reviews and tagged OPI on October 17, 2011 by Mary S.. Bother. Ordered all the glitters except for this one, and I absolutely adore it. Typical! That’s what I get for ordering without swatches. Kelsy recently posted: creme brulee. Thank you for the beautiful swatches and great review. You’re most welcome! I was very happy to have the opportunity to wear this and then share it with everyone. 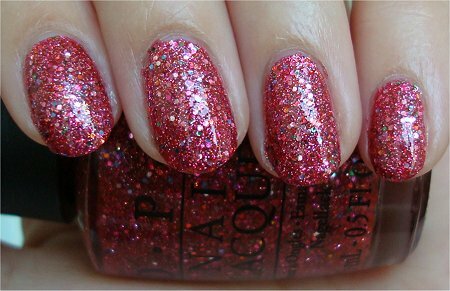 Yeah, people have told me how pricey OPI is in the UK…Honestly, I don’t know how I would feed my nail-polish addiction if I lived there. Hmm…maybe buying from eBay would be cheaper for you? My sister in law is taking me to cosmoprof this week and I am hoping to find the muppet collection there- don’t think I’ll pick up this colour but there are so many great ones I have no idea how to choose! Thanks for another super review! Ps.I loved your Sunday post this week! I had a lot of similar crushes growing up (not kid rock, sadly). Cheers! Rae recently posted: 100 Super Amazing and Interesting Facts about Me! 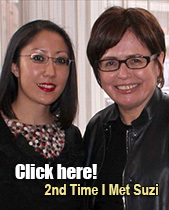 Hope you and your sister-in-law have a wonderful time at Cosmoprof. I’ve never been there, but from what I’ve read about other people’s experiences, sounds like it’s amazing with lots of things to see! You know, I love how we’re so comfortable with each other that you can say, “Speaking of puke”….haha! 😉 And then I’m all ears, and it’s not weird at all. Weee! 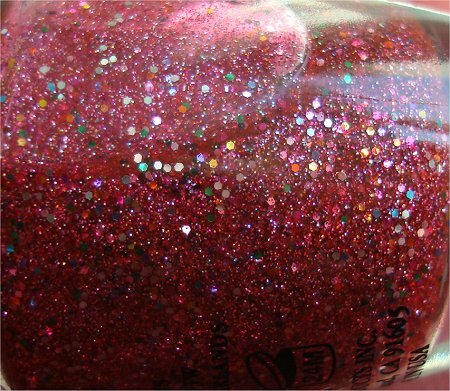 I can’t wait to see how Unicorn Puke looks like on your nails. I just adore your nail shape – everything looks so beautiful on them. 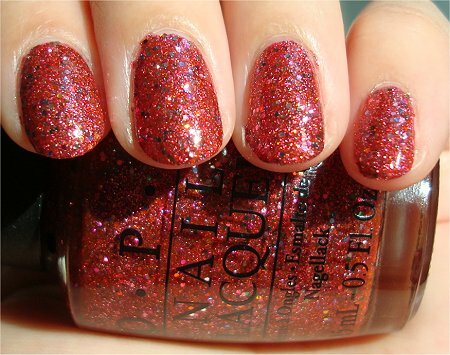 And that polish is so special – it has soooo much going on. Can’t wait to see it in person, too! 😀 Hurry up, bottle! And we shall continue to search for that one flattering pink because this definitely is not it. I got this color as a set (I mainly wanted Rainbow Connection and the indivdual bottles were sold out) and I agree it really isn’t the best color. Like Marta said.. it reminds me of pink puke as well. Not exactly what I want on my nails. 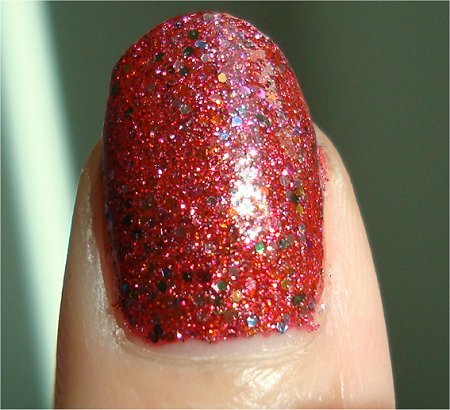 I wish the other glitters in this collection were opaque like this one though. Dang! I need a trade secrets next door. I’d probably supply 50% of their total business! haha, but seriously though that’s really awesome. I wonder, does OPI limit the number of bottles you can order? Perhaps to make the collections more special and rare? I mean, if a certain color is sold out everywhere why don’t stores restock more often? They’d make more money. 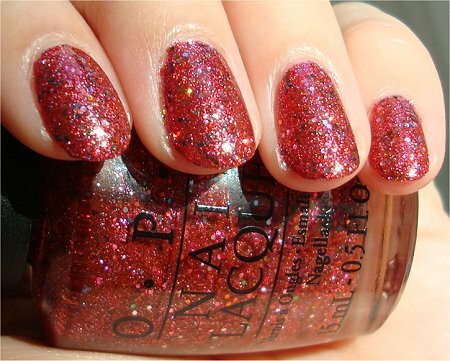 I remember hunting for OPI Crown Me Already, and finally found a bottle after the third store. The sales rep said I was lucky ’cause it was the very last bottle. I’m thinking to myself, “what’s stopping you from ordering more?”. Good question! I’m not sure if OPI limits their orders. But the one I went to had TONS of cardboard boxes that were filled with OPI polishes. Obviously I didn’t open them, but when I walked by the cashier, I saw all the boxes with “OPI” on the outside. And the employees kept refilling The Muppets display with bottles from those boxes, so I just assumed that all of them were from The Muppets collection. Maybe certain stores don’t stock up because they didn’t anticipate the demand. Haha, honestly! Just go to any nail blog and you can easily find out what’s in demand. 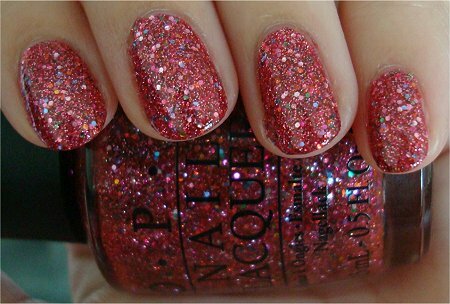 But maybe stores have to place their OPI orders even fartherrrr in advance. 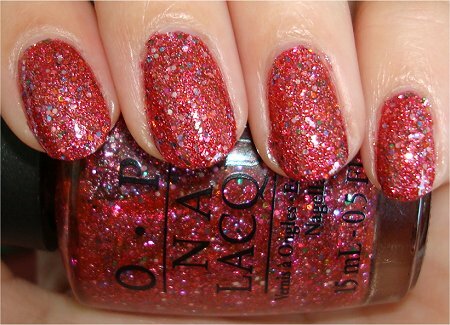 Or…maybe OPI allows certain stores (the ones that get more traffic) to order more bottles. Wow, yes, $5.99 is a fantastic price! I love this color! Mary you have the greatest swatches and make it so hard to resist!! Hehe, it’s cool that you like this more than I did. 🙂 And thank you so much for enjoying my swatches. I am very grateful that PR was nice enough to let me wear this shade. I love your review and how you took pictures of it under different settings. I got a mani and pedi with this colour and fell madly in love with it. However, it has been really hard searching for this colour. Really lucky that you got it as a present! I would buy it off you if I could haha! Thank you so much! 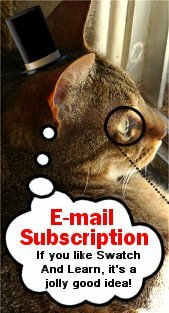 🙂 I’m glad that you really enjoyed this post and the polish, too! Yes, I feel very lucky to have it. I actually like it more now than I did when I initially reviewed it!